Friends of the Earth have a webpage claiming to be “fracking facts”. The key points I make are. The claims of dangers of fracking raise questions, that need to be answered before they can be considered credible. The claim that fracking could affect house prices is totally unsupported. The claim that shale gas will not significantly affect energy prices is based on out of date data. The British Geological Survey has shown that the potential of shale gas is huge. Friends of the Earth has played a major role in preventing that potential being realized. FoE has consequently helped prevent shale gas from relieving the energy crisis brought upon by the Climate Change Act 2008. Claims that pursuing shale gas in Britain will affect global emissions are pure fantasy. Also is a fantasy the belief that Britain is leading the way on emissions reductions. We ain’t leading if collectively the world is not following. The evidence shows clearly shows this. In the previous post I looked at how FoE blatantly mislead about an agreement they reached with the Advertising Standards Authority, which caused the unusual step of ASA Chief Executive Guy Parker issuing a strongly worded statement to defend the ASA’s integrity. I will look at various statements made (with FoE quotes in purple), showing how well they are supported by the evidence and/or providing alternative perspectives. From the section What are the dangers of fracking? Industry statistics from North America show that around 6% of fracking wells leak immediately. Leaking wells lead to a risk of water contamination. Lord Smith, former chair of the Environment Agency, has said this is the biggest risk posed by fracking. So it’s particularly concerning that the Government has now said it will allow fracking companies to drill through aquifers which provide household drinking water. If leaks are a problem, with respect to fracking in the UK has this been risk assessed, with appropriate measures taken to prevent leaks? Does that statistic of 6% allow for when there is natural leakage in the area of fracking leaking in the water supplies are venting into the atmosphere in the area where fracking is occurring? This was the case in the images of the flaming water faucet in the movie Gasland. Have there been steps taken in the USA to reduce genuine leaks? Has the proportion of wells leaking gas in the USA been increasing or decreasing? Has the average amount of gas leaked been increasing or decreasing? How when extracting gas from well below water aquifers, through a lined tube, that is both water-tight and gas-tight, is that gas (and fracking fluids) meant to leech into the water supply? Then there is the statement without evidence. Fracking could also affect house prices. This was one of the issues FoE in its agreement with the ASA have the assurance not to repeat claims that fracking affects property prices, unless the evidence changes. Legally there might be cop-out where that assurance does not apply to claims made on its website. Literally, the statement is not untrue, just as the claim that a butterfly flapping its wings on the North Downs could lead to a typhoon in the South China Sea. Would fracking bring down energy bills? It’s very unlikely. Fracking company Cuadrilla has admitted that any impact on bills would be “basically insignificant”. Claims that fracking would create a lot of jobs have also been overstated. According to Cuadrilla, each of its proposed 6-year projects in Lancashire that were recently rejected by the council would only have created 11 jobs. The claim about Cuadrilla is sourced from an Independent article in June 2013. “We’ve done an analysis and it’s a very small…at the most it’s a very small percentage…basically insignificant,” said Mark Linder, a public relations executive at Bell Pottinger who is also responsible for Cuadrilla’s corporate development. It is not surprising that shale gas developments in Lancashire alone will not have a significant impact on UK energy prices, especially if that is restricted to a few sites by one company. But over three years later the landscape has changed. The British Geological Survey has been publishing estimates of the quantities of shale gas (and oil) that exists beneath the ground. The figures are at first hard to comprehend. They are large numbers in units of measure that ordinary people (even people with some knowledge of the field) find hard to comprehend, let alone put into some perspective. In my view, the figures need to be related to annual British consumption. Page 8 of the DECC UK Energy Statistics, 2015 & Q4 2015 estimates gas demand at 794 TWh in 2015. The BGS uses tcf (tera cubic feet) for its’ estimates, which (like a domestic gas bill) can be converted from TWh. The 794 TWh is about 2.7 tcf. Not all shale gas is recoverable. In fact possibly only 10% of reserves is recoverable on existing technology, and depending on the quality of the deposits. There are also shale oil deposits, measured by the BGS in both barrels and millions of tonnes. Refinery production (a rough estimate of consumption) was 63 million tonnes in 2015. I will again assume 10% recovery, which may be overly prudent. On 23rd May 2014 BGS published the results for the Weald Basin, a large area in the South East of England. Whilst there were no significant deposits of gas, the central estimate of 591 million tonnes is enough to supply the UK for one year. On 23rd May 2014 BGS published the results for the Midland Valley of Scotland. The central estimate for shale gas was 80.3 tcf (3 years of UK demand) and for shale oil 800 million tonnes (15 months of refinery production). Most recently on 13th October 2016, BGS published the results for the Jurassic shale of the Wessex area. Central estimate for shale oil was 149 million tonnes, equivalent to three months of UK refinery production. In all, conservatively there is estimated to be sufficient gas to supply the UK for over 54 years and oil for two and half years. The impact on supply, and therefore the impact on jobs and (in the case of gas) on energy prices, demands on the ability of businesses to profitability develop these resources. As has happened in the USA, the impact on jobs is mostly dependent on the impact on prices, as low prices affect other industries. In the USA, industries that are sensitive to energy prices (or use gas as a raw material) have returned from overseas, boosting jobs. FoE has played no small part in delaying planning applications with spurious arguments, along with generating false fears that could have made regulations more onerous than if an objective assessment of the risks had been made. Fracking can’t help any short term or medium term energy crisis. Even if the industry was able to move ahead as fast as it wants, we wouldn’t see significant production until about 2025. This is actually true and up to date. If it were not for the Climate Change Act along with eco-activists blocking every move to meet the real energy demands in the most affordable and efficient way possible, there would be no prospective energy crisis. In terms of shale gas meeting energy demands (and gas-fired power stations being built) FoE should claim some of the credit for preventing the rapid develop of cheap and reliable energy sources, and thus exacerbating fuel poverty. Will fracking help us to tackle climate change? Shale gas and shale oil are fossil fuels. They emit greenhouse gases. Avoiding the worst impacts of climate change means getting off fossil fuels as soon as possible. Scientists agree that to stop dangerous climate change, 80% of fossil fuels that we know about need to stay in the ground. Setting up a whole new fossil fuel industry is going in completely the wrong direction, if the UK is to do its fair share to stop climate change. The hypothesis is that global emissions lead to higher levels of greenhouse gases. In respect of CO2 this is clear. But the evidence that accelerating rate of rise in CO2 levels has led to accelerating average global temperatures is strongly contradicted by real world data. There is no scientific consensus that contracts this conclusion. Further there is no proper scientific evidence to suggest that climate is changing for the worse, if you look at the actual data, like leading climate scientist Dr John Christy does in this lecture. But even if the catastrophic global warming hypothesis were true (despite the weight of real world data against it) global warming is global. Britain is currently emitting about 1.1% of global emissions. Even with all the recently discovered shale gas and oil deposits, under the UK is probably less than 1% of all estimated fossil fuel deposits. Keeping the fossil fuels under British soil in the ground will do nothing to change the global emissions situation. Britain tried to lead the way with the Climate Change Act of 2008, in committing to reduce its emissions by 80% by 2050. The INDC submissions leading up to COP21 Paris in December 2015 clearly showed that the rest of the countries were collectively not following that lead. The UNFCCC produced a graph showing the difference of the vague policy proposals might make. 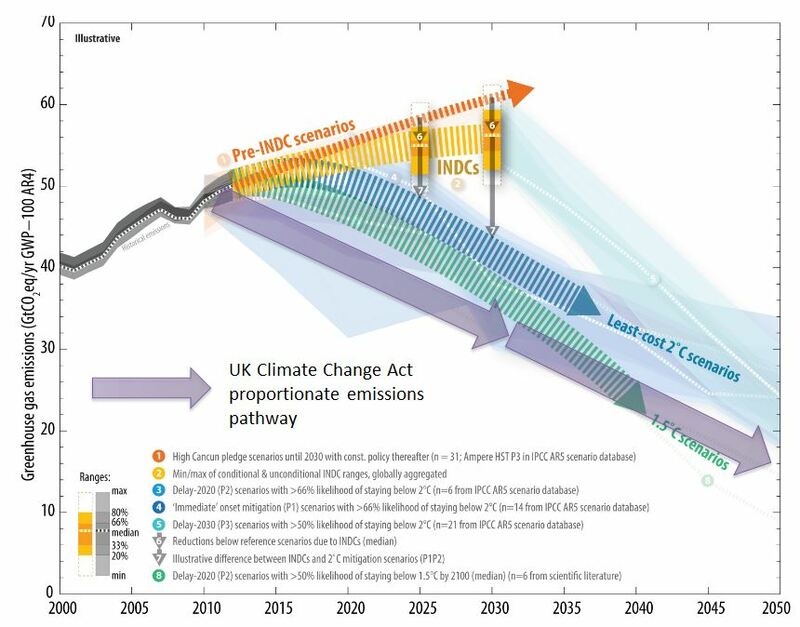 I have stuck on the approximate emissions pathway to which the UK is committed. The FoE is basically objecting to fracking to keep up the appearance that the UK is “doing its bit” to save the world from catastrophic global warming. But in the real world, global warming ain’t happening, neither are the predicted catastrophes. Even if it were, whatever Britain does will make no difference. FoE attempting to deny future jobs growth and stop the alleviation of fuel poverty to maintain the fantasy that Britain is leading the way on climate change. Isn’t it better to have our own gas rather than importing it? If we went all out for shale, our gas imports would stay at current levels as the North Sea supply declines – and imports could increase by 11%. This claim, without any reference, is based likely based on the same out of date sources as below. If FoE and fellow-travellers kept out of the way with their erroneous legal challenges and distortions then shale gas has a huge potential to cause imports to decline.